Archmage Geirmund was an Archmage of Windhelm and Personal Battlemage to High King Harald. He doesn't appear in the history of the First Era until after the sons of Archmage Gauldur killed their father, stole his powerful amulet, and began terrorizing Nordic villages across Skyrim. They caused so much havoc that Harald sent a company of battlemages led by Geirmund to stop them. The battle was devastating, but eventually Geirmund and his company forced the brothers to flee and tracked them down, one by one. Geirmund's forces suffered great losses in each encounter, but finally, only the middle child, Sigdis, was left standing. When he could flee no more, Sigdis challenged Geirmund to a duel in the fields near Ivarstead, a challenge which Geirmund was honor-bound to accept. Geirmund was slain, but he managed to take Sigdis with him, bringing an end to the Gauldursons' rampage. To commemorate his courage, Harald ordered a tomb built for Geirmund, and had Sigdis interred there, as well, so that he would be forever guarded by the one who slew him. The tomb was built on an island in Lake Geir, which takes its name from the fallen Archmage. Then King Harald began an age-long campaign to erase all knowledge of the Gauldur tale so that his powerful amulet would not be reforged and used to threaten Skyrim once more. He did not succeed fully, as in the mid-Second Era, bards still sang about Geirmund's sacrifice, and there was even a festival to his memory, regularly held on the site of his tomb. In time, however, the story became gradually forgotten, and by the Fourth Era, it was known as the obscure "Forbidden Legend" and very few sources mentioned it. 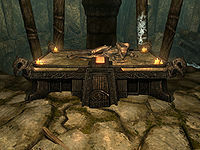 In 4E 201, the Last Dragonborn learned of the legend and disturbed Geirmund's tomb in order to retrieve Sigdis' portion of Gauldur's amulet. Geirmund did not seem to mind, although the draugr Sigdis took great exception. ^ a b Events of Skyrim.